I’m not going to say this banana bread is super healthy and you should eat it every day… but on the scale of banana breads where most are loaded with sugar and white flour this is at least a few steps away from sugar oblivion! After Greg commenting at the look of the bananas sitting on our kitchen bench I decided to quickly whip up some muffins or banana bread. After a quick scan through the below recipe I knew I had everything to make it so away we went! Add the baking soda, vanilla, salt and cinnamon, and whisk to blend. Lastly, switch to a big spoon and stir in the flour, just until combined. If you’re adding any additional mix-ins, gently fold them in now. For some reason I have an amazing Chocolate Chip Cookie recipe. I don’t know what it is, but most people will request the cookies (if I am coming over) or they sell like hotcakes if we have a fundraiser. While I’m not much of a sweet tooth, I can definitely eat one or two of these no problem. My most famous (I use that word pretty lightly..haha) combination would have to be: Chocolate Chip, Pretzel and Snickers Cookies. One of our close friends is allergic to nuts, so more often than not I switch to Chocolate Chip and Mars Bar Cookies. So, below is my basic Chocolate Chip Cookie recipe that I use, with a note as to where you can add any inclusions! *This is where you’ll add any inclusions- add chocolate chips and chopped Tim Tams. Mix until combined. Roll into -balls and place on a baking tray. For storage, I place them on a plate with a slice of bread (don’t let the bread touch the cookies) and wrap with cling wrap. An alternative is to place the cookies in a container and place a piece of baking paper on the top layer and place the piece of bread on top. The bread will draw all the moisture from the air and keep the cookies soft. I know there’s probably a stigma from some people about packet mixtures (my mum is one of those).. Contrary to these people I am a full supporter of packet mixtures (pre-mixes) and icing. They are the best of so many worlds! 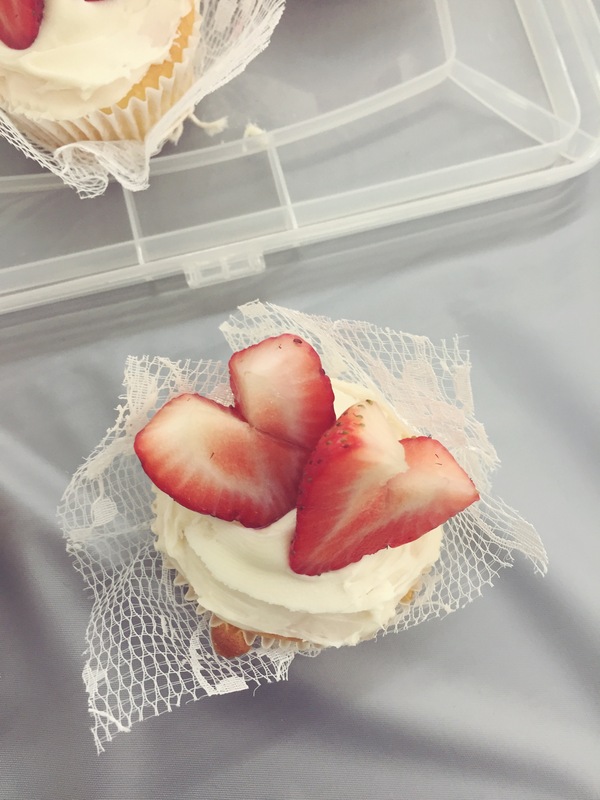 Below are cupcakes I made for a recent bridal kitchen tea. 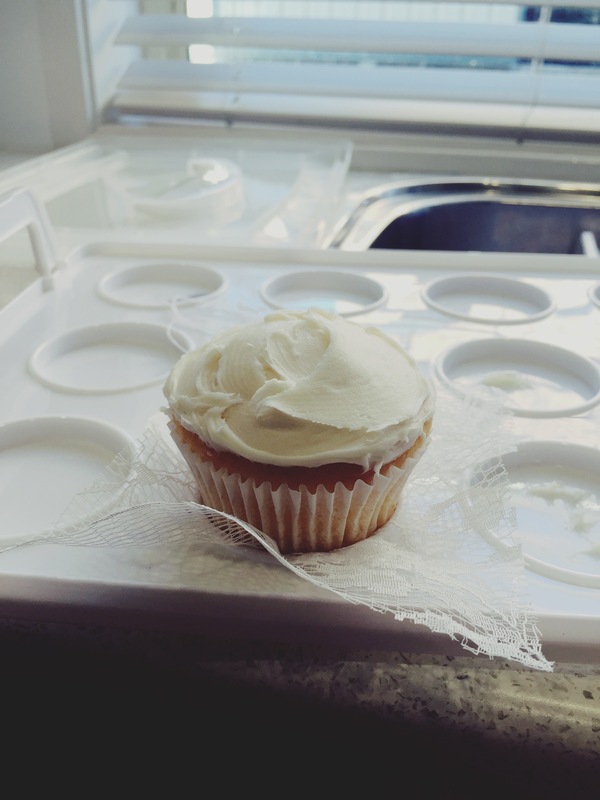 I used a vanilla cupcake mixture and Betty Crocker’s vanilla icing. 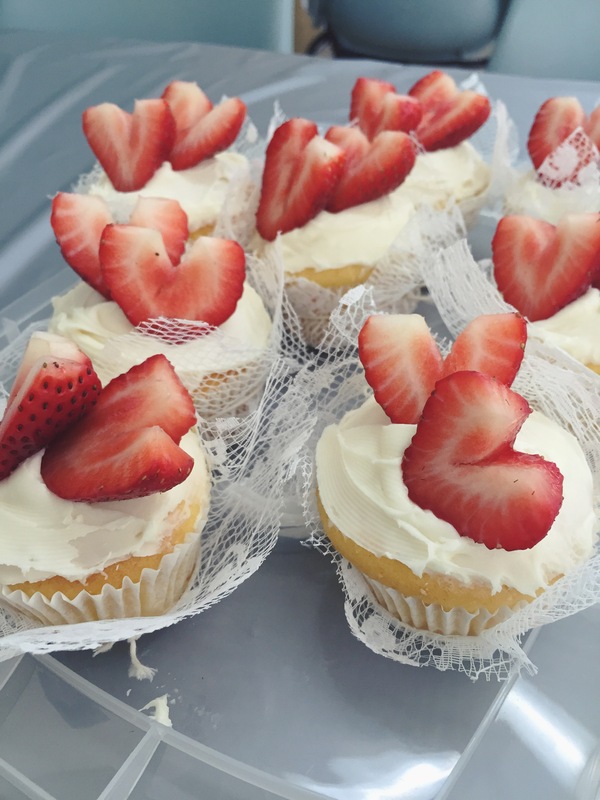 I topped the cupcakes with strawberries (cut following this easy YouTube video). First cut the lace into squares (long enough so that the lace reaches the frosting)- I found by sticking the lace edges to the frosting it helped with keeping the lace upright for a minute so I could tie the twine. 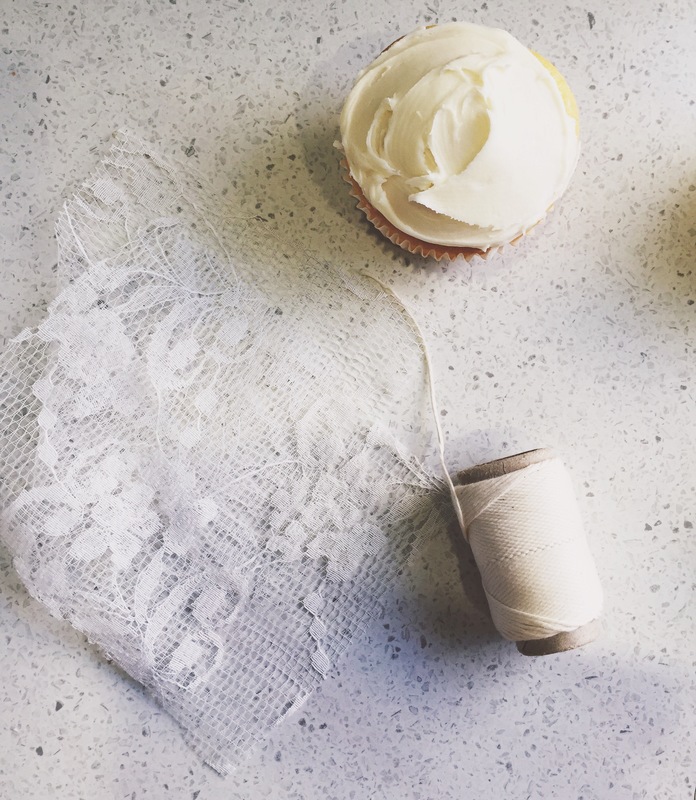 Using twine tie a knot around the cupcakes to keep the lace in place. While there isn’t much of a recipe here- hopefully it will push you to try a good cake or cupcake pre-mix! I am not a cake eater- my husband, on the other hand, would eat cake every day if he didn’t put on weight! The recipe comes from a very close family friend of ours. When Greg moved here from the States he fell in love with this chocolate cake- the fluffiness, the icing- he falls into a state of euphoria every time he sees the cake present itself at our family functions. I am all for taking shortcuts- I love Betty Crocker’s frosting and Donna Hay’s packet mixtures but this cake takes the prize! The great thing about the cake is- the ingredients are generally things you would have in your pantry already! Enjoy! 1. Beat butter until creamy, add sugar, eggs and vanilla and beat until light and fluffy. Blend cocoa in hot water to make a smooth paste. Gradually add to creamed mixture. Add vinegar to milk to sour. 2. Sift together flour, baking powder, bicarbonate soda and salt, and add to creamed mixture alternately with sour milk. Stir lightly but thoroughly. Pour into two greased 20cm (8 in) sandwich tins and bake in moderate oven (180 C or 160 C fan forced) for 30 minutes or until tops spring back when lightly pressed. 3. Cool in tins for 10 minutes then turn out and allow to cool completely. Fill and ice with Chocolate Vienna Icing. Decorate with chocolate curls if desired. Beat butter until creamy. Sift icing sugar and blend cocoa with hot water smooth. Add the icing sugar to the butter alternately with sufficient of the cocoa mixture to spreading consistency.